Designed with luxury in mind, the BMW 5 Series boasts style and class. It also comes with power to match! With its elegance and driving dynamics, a used BMW 5 Series remains in a class of its own. 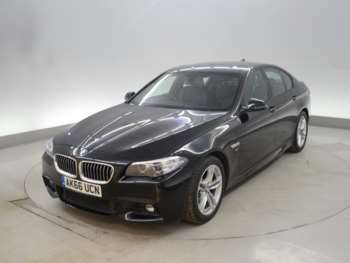 A second-hand BMW 5 Series is a mid-executive saloon that’s been perfectly designed to keep you happy. It’s the car that every manufacturer aspires to build, due to its unrivalled shape, design and practicality. This motor is an expensive top-of-the-range vehicle with a vast amount of power and more performance than you could ever imagine. Cruise control, climate control and traction control are available as standard. Whichever model you choose, you’re guaranteed to be happy with the tech, as the BMW 5 Series remains cutting edge. Most of the BMW 5 Series models are designed to be powerful and economical. So even a small-engined 520d will keep you entertained on long journeys. The best diesel comes with the 530d and 535d. These beautiful engines are very impressive on the road. Like any used BMW, quality is of paramount importance. They are well-built cars, so in theory, there shouldn’t be too many problems when you buy one second hand. Putting it simply, a second-hand BMW 5 Series drives brilliantly. It is not a small car by any means, and although some of the models do drive a bit harshly – thanks to the suspension – they are just awe-inspiringly superb. There’s little body roll, lots of power and plenty of composure through every bend. The M5 takes power to a whole new level, with a 500bhp V10 engine. You won’t be disappointed with the comfort, style and driveability that the used BMW 5 Series offers.